Today I’ll be providing a review so that the readers of binary today understand if this is a worthwhile trading system or not. First of all, I have to point out that the Terabit Trader optical data transmission technology is not a new development. 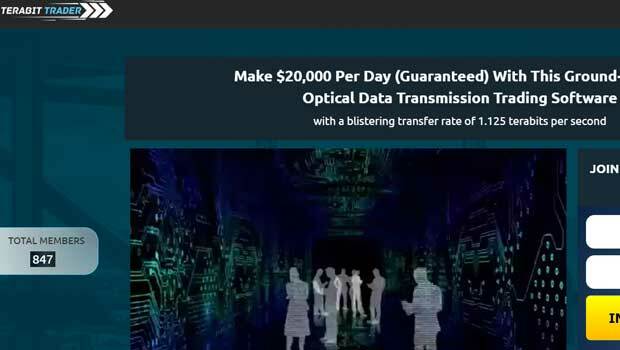 This technology is used frequently by small Internet service providers and as far as I’m concerned it wouldn’t play a large role in the success or failure of any binary options product. I believe that the developer Richard Heffner only discusses this technology because it makes the software seem more credible. I don’t see how this technology would have any practical impact on binary options trading and make this software any different from any other auto trader that came before it. This is really along the same lines as developers that constantly push the concept of high-frequency trading. The only purpose of this type of technological inclusion is to make the software come across as more important. Richard Heffner is the developer of the Terabit Trader system and he feels that this is the best binary options product ever released. However, we have seen Richard many times in the past making the exact same claims about other systems. To add to this, Richard also provides a very low level of customer support. This is the same developer that promoted Safeguard Trader and GPS Trader, both confirmed scams. Both of these systems failed miserably and they also came with very large promises of guaranteed success. This alone is enough of a reason to avoid this product. Considering Richard is the common link between 2 failed systems promoted the exact same way it’s easy to see the likely direction is a 3rd failure. With these types of odds I don’t see why anyone would sign up with this new binary options trading system. It’s very clear to me that the Terabit Trader is another losing proposition. The developer of this software instills me with nothing but fear for my money and the money of my readers. Please play it safe and avoid this binary options software at all costs. While Richard wants to guarantee $20,000 a day I can guarantee nothing but misery from this product. If you are binary options trader looking for real gains I suggest that you check out the binary 5 system that currently has over 200 comments on my review just a month from release. This is a software you can trust and rely on to grow your accounts. Thanks for coming to binary today and I hope you come back again soon. Richard’s claim is impossible, when he shows his bank statement you see a balance of $130 million plus . You see the deposits of around $20,000. He said he has been doing this for 5 years, so if he deposits $20,000 per day, 5 days a week, that is about 5.2 million per year or 25 million total. The 130 million do not compute..
the problem is if you sign up for the terabit software and you get a call from a broker to set you up on their platform to trade then you ask some questions.if you ask about the promises made in the video like the guarantee to make up the daily account balance to the $20k promised along with all other promises made in it.the broker will then tell you not to be stupid and make you feel like a fool by telling you how you expect to get 20k a day from a starting capital of $250? basically they tell you what you should have worked out yourself if you have half a brain.my biggest problem is how these videos are allowed to advertise such lies and get away with it.if ford advertised a car that guaranteed to get 200 miles per gallon and you bought it and it only got 30mpg then they would be in trouble and you would be refunded any money paid. try getting your balance after trading for 24 hours with terabit made up to 20k if your balance is only $100 more than your deposit of $250.YOU HAVE NO CHANCE!